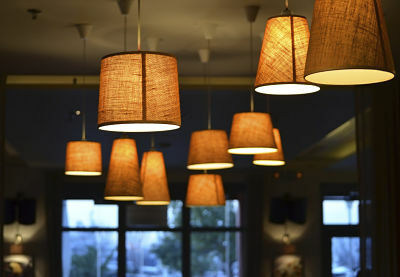 Great lighting can emphasise your home interior decor and transform the atmosphere of your home! 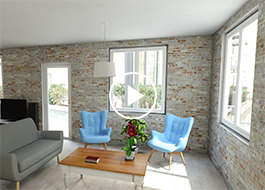 Here are 10 basic rules to perfect different lighting effects in various rooms. Think about lighting before completing your decorating ideas. Consider electric cords, plug sockets, switches and the strategic placement of these necessities. Make sure to cover all four main lighting positions: general, temporary, functional and decorative. When they are projected on a defined surface, rays of light enhance an area or an object. Powerful and direct lighting is quite decorative but can be blinding and create shaded areas. Indirect lighting softly lightens up the entire room. Let’s imagine two different atmospheres. A soft and subdued one for quiet times and another more intense one. For this you can use red or yellow light bulbs which create a sense of warmth. On the contrary, white light bulbs will give the impression of freshness. Avoid a dazzling effect by hiding light sources. Place them in a corner and choose to use either filtered light bulbs or wall lamps. Incandescent lamps are going to disappear and halogen lamps consume too much electricity. We recommend using a neon-compact bulb which consumes less but has a large electromagnetic radiation. Or you can use a LED light bulb which is more efficient and consumes less, but take note that they can be slightly more expensive. Forget about classic ceiling lights. By evenly lighting a room, they give the impression that the room is smaller than it actually is. We like hanging lights and the fact that you can always combine them with other sources of light in a room. Well-illuminated walls make a room look bigger, that’s where wall lamps come in handy. They can also be combined with fairy lights. On a nightstand or on your desk, a lamp suited for reading or for working on your computer is a great idea. Elsewhere, on furniture or in different corners, adding bright objects creates the perfect atmosphere. Always remember how lights can make your life more comfortable. For example, by installing them in the closet and drawers, thereby making it easier to keep everything in order. On top of a mirror, in a hallway or on the landing, these kind of lights are necessary and facilitate daily life and at the same time contribute to the general atmosphere of the home. For living areas, use light bulbs of 15 to 20 watts. For bedrooms, use light bulbs of 10 to 15 watts. If you want to play on a room’s dimension using lighting, remember that a light which goes from the ground to the ceiling enlarges the room and is the best way to do it. On the contrary a ceiling light as the only source of light will make the room seem smaller.